Town Hall Pharmacy (or Raeapteek as Estonians call it) is one of the oldest operating pharmacies in Europe. The medieval pharmacy building looks more like a small shop rather than a pharmacy. 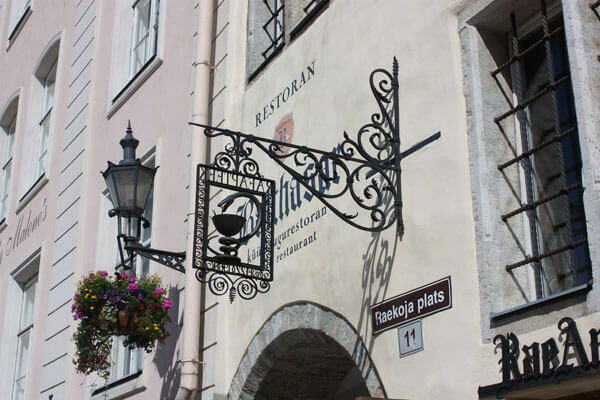 The year of its opening is a mystery, but the documents of the town council in Tallinn say that in 1422 the pharmacy already had changed its third owner. It was also a place where many important political or trade-related decisions were dealt with over a glass of Klaret, a sugared and spiced Rhine-wine. The owners frequently changed until 1580. In 1580 a Hungarian immigrant Johann Burchart Belavary de Sykava came to Tallinn and since then bounded the pharmacy with the name of Burchart for 300 years. Their ownership ended in the 1890’s, when the last Burchart male heir died. During medieval times the pharmacy sold a great variety of different medicine, which today will sound absolutely strange and even ridiculous. These strange concoctions include snakeskin potion, mummy juice, burnt bees, earthworms, bat powder, unicorn horn powder, swallow’s nests. But of course it was not all that you could buy there. You could also acquire ink, sealing-wax, gunpowder, dyes, paper, candles, torches, tobacco, and even cookies, candies, and marzipan. Nowadays the pharmacy continues to function, but, of course, it is keeping up with the times. There you can buy the usual aspirin or even a bottle of the above-mentioned Klaret. You can also take a look at old medical instruments and other curiosities since the part of the building has become a museum. If you are planning to visit this place be sure to peep into the back room where you will be able to see an exhibition on medicines and the pharmacy’s stocks from the 17th to the 20th centuries.